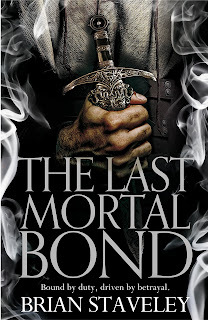 The trilogy that began with The Emperor's Blades and continued in The Providence of Fire reaches its epic conclusion, as war engulfs the Annurian Empire in Brian Staveley's The Last Mortal Bond. But the three imperial siblings at the heart of it all—Valyn, Adare, and Kaden—come to understand that even if they survive the holocaust unleashed on their world, there may be no reconciling their conflicting visions of the future. One one thing is certain: the Chronicle of the Unhewn Throne will end as shockingly as it began. The Chronicles of the Unhewn Throne has been a bunch of fun from word one, but just as the by-the-numbers beginning of the trilogy belied a book both longer and leaps and bounds more likeable than The Emperor's Blades, my problems with The Providence of Fire led me to believe that The Last Mortal Bond would be, at best, a good conclusion. And it is that... for a start. 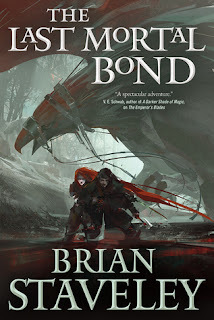 The conflict between Annur and the Urghul, which has so long stalked the fringes of the fiction, finally takes centre stage, and it plays out exactly as impactfully as I had hoped; the setting, so boldly embiggened by Brian Staveley in book two, continues to sing; meanwhile most, if not all, of the central characters' arcs are resolved in reasonable and rewarding ways. This much, and more, I expected from The Last Mortal Bond. What I didn't expect was that it would take my breath away. But it did. This is the end, my friends, so spoilers about the previous novels are unavoidable. She had taken that title, had demanded it, not so she could primp atop an uncomfortable throne to the flattery of courtiers, but because she'd believed she could do a good job, a better job, certainly, than the man who had murdered her father. She'd taken the title because she thought she could make life better for the millions inside the empire, protect them, bring peace and prosperity. And failed, I'll say, rather spectacularly. "With an Urghul army pressing down from the northeast, a false council of incompetent, power-grabbing whores holding Annur, the near-utter collapse of the legions in the south [...] thieves and bandits prowling the land, and pirates pillaging the seas," (pp.46-47) pretty much everything that could have gone wrong—for Adare and, in turn, the empire entire—has gone wrong. To make matters worse, the only person capable of keeping the so-called "barbarians" (p.29) at bay is il Tornja—and he's not even a person, proper. He's one of the few surviving Csestriim—an ancient, emotionless race "responsible for the creation of civilisation" (p.651)—and what he's actually after is anyone's guess. But for now, much as Adare might like to make untrustworthy il Tornja pay, she needs him; needs him enough to have buried a blade in her brother Valyn to protect said Csestriim. Cannily, Kaden, in his capacity as First Speaker for the crapshoot of a council established in place of an actual Emperor, talks the representatives of this ramshackle republic into a treaty. It calls for Adare to come back to the capital; to sit the Unhewn Throne, albeit only as a symbol, and in so doing unify Annur's divided forces against the Urghul. Seeing an opportunity to make life a little easier for the millions of individuals she took on the aforementioned title primarily to preserve and protect, Adare agrees to the terms of the treaty, and travels to the capital... only to be greeted by a populace that's been poisoned against her. So it is that Adare and Kaden's plotlines come crashing together in an immensely satisfying fashion. In a sense, her struggles and his become one, but—and of course there's a but—that doesn't mean they immediately see eye to eye; first they have to sort through all the misunderstandings and elaborate fabrications compounded by the careless whispers that are all they've had of one another since the assassination of Sanlitun at the outset of Staveley's series. And fabulously frustrating as this series of unfortunate events has been, there relief here, readers, for that feeling. So it is, too, that a pivotal portion of The Last Mortal Bond takes place in precisely the same place where the whole shebang began in The Emperor's Blades. Annur is a city we've been to before, and bought the T-shirt to boot, but the context and texture of the wider world we've witnessed since makes it markedly more momentous—markedly more meaningful, even—than it was, so we're well and truly invested in its success by the time the Urghul arrive. Furthermore, the fact that The Chronicles of the Unhewn Throne comes to a conclusion exactly where it started leads to a pleasing sense of predestination that speaks positively of the author's plotting. On the other hand, there's Valyn. I don't want to say too much about Valyn. 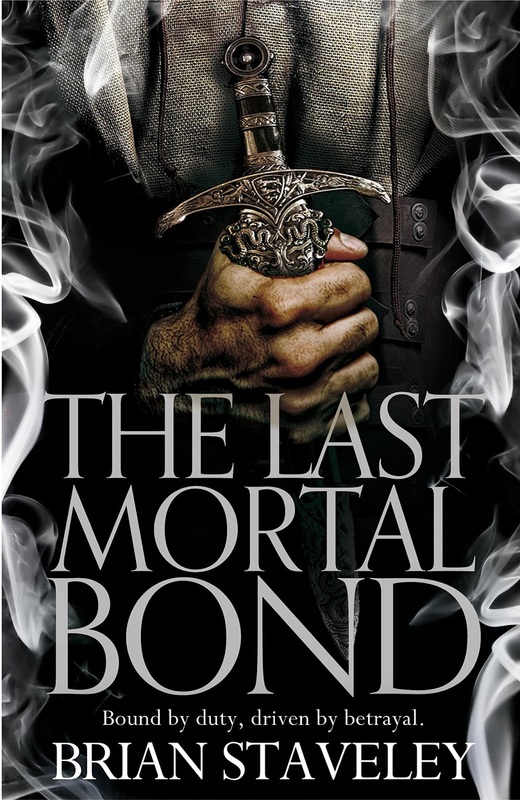 That he has a part to play in The Last Mortal Bond at all will be a surprise to some, given that he was on death's door when last we checked, but even the cover, lovely as Richard Anderson's art is, gives more of the game away than I'm comfortable discussing. Suffice it to say that Valyn's survival is just about the most interesting thing that happens to him. As a character, he's had nowhere of note to go since saving Kaden, and his share of the story, so truncated and aimless in book two, is equally abbreviated and ill-treated here, as all Staveley can make of him is mindless muscle. That's deeply disappointing—given how surprising the rest of this series has been, readers will have had every reason to believe its author had something special up his sleeve—but The Last Mortal Bond is remarkable in every other respect: in the development of its other central perspectives; in the expansion and then the contraction of its epic but still intimate secondary world setting; in the pace and the ultimate punch of its complex plot; and in the quality, on the lexical level, of the author's already-polished prose. 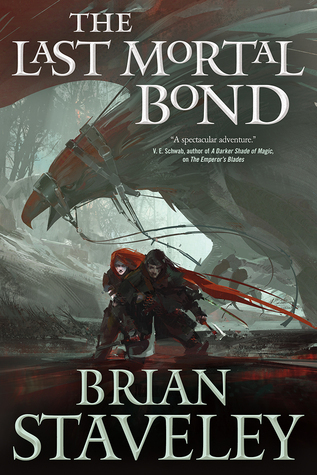 The Chronicles of the Unhewn Throne is a trilogy that's gone from strength to strength as it's gone on—that's gotten not just bigger but measurably better with every increasingly vital volume—and it's my pleasure to tell you that The Last Mortal Bond is, without question, Staveley's most impressive and immersive effort yet.